Pahalgam is a noted tourist spot located in the Anantnag district of Jammu & Kashmir and is situated at an elevation of 2740 m. It is abundant in dense forests, beautiful lakes, crystal clear streams, and meadows of flowers. Tourists other than admiring the beauty of this place can also undertake treks to Chandiwar, Aru Valley, and the Kohli Glacier with Pahalgam as a base. Mattan, Tarsar Lake, Shikargah, Sun Temple, Aishmuqam, Lidderwat and Mamaleshwar Temple are some of the prominent tourist spots here. The scenic beauty of this place has resulted in a number of Bollywood movies being shot here. Let us take a look at some of the sightseeing places that Pahalgam has for its visitors. Click Here for the Best Deals in Pahalgam Hotels. Srinagar Airport is the nearest airport to Pahalgam and is located at a distance of 95 km from Pahalgam. Tourists can hire taxis or buses to reach Pahalgam from the airport. The nearest railway station to Pahalgam is also at Srinagar. It is connected to all the major cities. If one wishes to travel by road then the city of Pahalgam is located at a distance of 828 km from Delhi and 95 km from Srinagar. Tourists can take the NH 1A to reach the valley of Kashmir. Aishmuqam is situated on a small hill at a distance of 86 km from Srinagar. It is a shrine built in honour of Baba Zaina-ud-din Wali, a renowned Sufi saint who is also known as ‘Zaino Shah Sahib'. The shrine houses the main sanctorum, deep inside the cave and ‘The Rod of Staff' of the Prophet has been kept inside the room. Every year, in the month of April, the week long Zool festival is organized at Aishmuqam. During the procession, disciples carry torch lights which represent the blessings of the saint on the people. It is a place of religion and one will find many a Islam follwers coming here in the month of April to participate in the Zool festival here. Aru Valley is located at a distance of 11 km from Pahalgam and is situated at an altitude of 2408 m. It offers a magnificent view of the valley to its visitors and tourists can undertake a trek across Lidderwat extending up to the Kolahoi Glaciers. The site, amid lush green grasslands, makes it ideal for camping. Trekkers can also take up a 3 day trek to Sonamarg with Aru as their base. Baisaran is situated at an altitude of 2438 m and is at a distance of 5 km from Pahalgam. Magnificent snow covered mountains, dense pine forests, and sprawling meadows attract tourists to Baisaran. The top of the hill allows for a breath taking view of the Lidder River Valley and Pahalgam Valley. This place serves as a picnic and camp site for tourists. Betaab Valley is famous among tourists for its scenic beauty and was renamed after a Bollywood movie called ‘Betaab'. Located 7 km away from Pahalgam, the valley is also noted as the river mouth of Sheshnag. Snow-covered mountains, deodar forests, pine trees, crystal clear streams, warm sunshine, and willow trees are some of the major attraction of this location. Tourists come here to enjoy the view of nature that surrounds them here. Chandanwari lies at an elevation of 2923 m and is located at a distance of 16 km from Pahalgam. The snow covered mountains and breathtaking scenic beauty attracts numerous visitors here. It also serves as a point for reaching Amarnath which is a popular pilgrimage destination for the Hindus. Hajan is a popular tourist spot famous for the Bollywood movie scenes that have been shot here. Situated close to Pahalgam, it is located in the Baramulla district of Jammu & Kashmir. Tourists can enjoy the panoramic view from the site which lies at an elevation of 1556 m.
Kolahoi Glacier, also known as the hanging glacier, is located in the Lidder Valley. It is advised that tourists see this glacier from the right side as there are less boulder fields in that area and also the left side is considered unsafe as a vantage point. The only way to reach up to this glacier is by trekking, which is quiet difficult in these terrains. It is therefore suggested that amateur trekkers do not do this without professional guidance. Sheshnag Lake is situated at a distance of around 27 km from Pahalgam and is at an elevation of around 3658 m. It derives its name from the seven headed serpent king of the Hindu mythology, Seshnag, and owes it to the fact that it is surrounded by seven peaks. Travellers have to undertake a two day long hike from Pahalgam in order to reach the destination. The lake remains covered in ice throughout the winter till the month of June. Thousands of devotees visit this site during the summer season while on their trip to the Amarnath Cave. Sheshnag Lake is perfect for tourists looking forward to some camping. Tulian Lake is situated at a height of approximately 4000 m and is at a distance of about 15 km from Pahalgam. 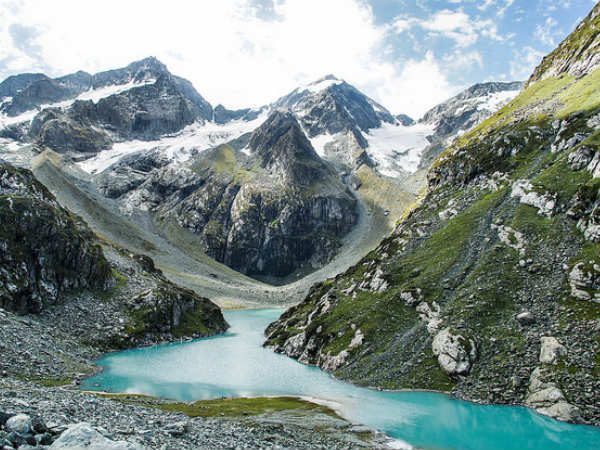 Also known as Tarsir Lake, this place can be reached after a two-day trek from Aru. A prominent feature of the lake is that it remains frozen almost throughout the year. Tourists can enjoy the view from here. It is also an ideal spot for camping and picnics. The Mamaleshwar, also called Mamal Temple, is located about 2 km from the bustling town of Pahalgam. This anceint temple is dedicated to Lord Shiva and is believed to date back to AD 400. It is a beautiful temple that is located at an even beautiful location, by the banks of Kolahoi stream, which is the source of the Lidder river. To experience the beauty of Kashmir at Pahalgam, take a pony ride or hike up the beautiful Kashmir Valley, located about 6 km from Pahalgam, after Baisaran. Filled with charming views, lush meadows and forests, refreshing streams and stunning vistas of the sprawling valley and tall mountains, Kashmir Valley is a must-visit tourist attraction when in Pahalgam. Whether you are a golf enthusiast or not, golfing at the Pahalgam Golf Course will be a unique experience. Surrounded by tall pine forests, snow-clad mountains amidst the cool weather of Kashmir, playing a game at this high, 18-hole golf course will be a memory that will surely stay with you for a long time.